He's not the slap-'em-up type of builder"
Relatively speaking, DDDA is above board. Relative to Anglo-Irish Bank that is. A relative to a Becbay site developer now has a curiously strong link to a new director of the no-appeal planning autocracy for the €450 million site. This is all legal. Relatively speaking, Shelley McNamara is the sister of Bernard McNamara, and is no doubt above board. 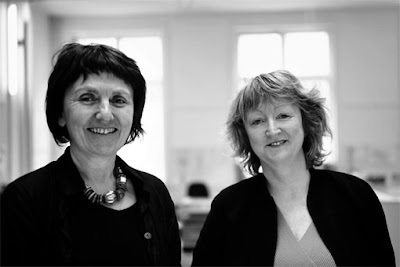 Shelley McNamara and Yvonne Farrell founded Grafton Architects, a firm with substantial governmental contracts. Yvonne Farrell, Ms McNamara's co-director at Grafton Architects has been anointed to the DDDA board by Mr John Gormley of Green-FF. DDDA is jokingly known within Anglo-Irish as our Developers Autocracy. There is no fair reason whatsoever to conclude a family connection necessarily causes conflicts or even a conflict-of-interest. Is there any possibility, however remote, of any influence or communication? Perception is king. Make your own conclusions. DDDA dictates the no-appeal planning permissions for the Becbay site where Mr McNamara is an apparently stress-tested investor. Possibly informed by Anglo's lawyers who in turn inform the Financial Regulator, the DDDA denies there are any conflicts of interest. Perhaps if the monkey can not see the hose he or she will not be influenced by the cold water. The DDDA must be shut down immediately. During the one-way "Statutory Public Consultations" the DDDA has apparently withheld information on it's secret schemes to elevate "ground-level" in Poolbeg by up to 30 feet. ApparentlyDDDA has also kept secret its scheming for a hundred thousand square foot logistics centre under the SPA nature reserve. DDDAs schemes on the floodplain will frequently flood Sandymount and Ringsend - perhaps once every ten years instead of the current 1 in 200 year assessment. 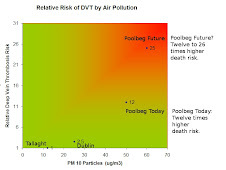 After April 2009, as is dictated by the Environment Ministry of John Gormley, the public can not make any comments on the DDDAs schemes for Poolbeg. 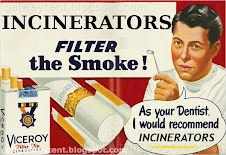 DDDA will be free to dictate whatsoever it and its cronies pull out of a hat. DDDA is an anti-democratic autocracy controlled by the interests - especially Anglo Irish Bank - which have bankrupted Ireland and which are looting the National Pension Reserve Funds. Is this (job unadvertised?) DDDA appointment by Mr John Gormley consistent with the reasons and perceptions whereby The World Bank now ranks Ireland worse than Botswana, Ghana and China for Corporate Legal Corruption? Risk-Ranking using this data increases the interest-premium on Ireland's national debt by €276 million for each €10 Billion borrowed by BIFFO from China. Tired and emotional BIFFO calling China in the middle of the night adds an extra few punts. The reason for Ireland's out-of-control borrowings is the Green-FF building industry pyramid scheme run from The Galway Tent. The newest DDDA Charirman is from the Green-FF building industry. At least the Dutch were left with some diseased Tulips. And they were not green. Shelley McNamara With A DDDA Director. DDDA is regarded by some as the rubber-stamp-planning-autocracy for Seanie's Anglo-Irish Bank. Bernard McNamara is obliged to pay 17% interest on loans for his leveraged assets in the Irish Glass Bottle site. Anglo-Irish Bank handed out €288 million for the site. The big boys in DDDA have 'invested' about €40 million of taxpayer funds. To get the money back DDDA can permit an appropriate change of use - perhaps a Casino. Based on current market values the IGB site has lost €300 million to €400 million since 2007. Taxpayers are now liable for €288 million, excluding the DDDA losses. Legally taking the €288 million from taxpayers requires a property tax of €10,000 for each of the 3,000 houses in Sandymount for each of the next 10 years. The public softening up process has started on the public broadcaster & in the advertising dependent newspapers - such a tax to pay for DDDA's hole-in-the-ground is likely to be introduced by 2010. If the Developers Autocracy does not grant planning permission at Becbay the investors will lose perhaps a further one to two billion Euro in future gains. More immediately, the house of cards involving DDDA, Anglo and Becbay could collapse when "non-nationals" demand their cash back. said one conservationist, who credits his sister, Shelley McNamara, with sparking his keen interest in the architectural innovation that marks out his projects. Goodbody Stockbrokers expects the six Irish lenders to write off a total of €27.7 billion over the three worst years of the crisis, 2009 to 2011, and €35 billion over four years, to 2012. Analysts at JPMorgan estimated last week that loan losses at the Government-guaranteed Irish-owned lenders, excluding EBS, would reach €26.9 billion and that they may require a further €12.9 billion injected in capital, in addition to the €7 billion being invested in Allied Irish Banks (AIB) and Bank of Ireland. Scientists say a chimpanzee in a demonstrated an ability to plan for future events. What exactly did the chimp do? I stumbled across your little "blog", or should we call it a rant, after reading an article in the Irish time today (28/07/2010) on the Glass Bottle Site. I think maybe you should go back to the drawing board – get a copy of the Planning and Development Act 2000 (Section 85 in case you have trouble) and read up on what you write! What the DDDA have permission to do and what they have done is perfectly legal and all above board! It seems to me that there is a lot of ‘apparently’ in your 'rant' which to me equates to not actually knowing what you are talking about! I do not argue that there is corruption in our government but you give me a government with no corruption! If the opposing party was in power do you not think we would be in the same situation in which we are today? I may remind you that this is a world recession not just an Irish one. Have you been to the Docklands area recently - can you tell me that this area is not thriving due to the work which has been carried out by the DDDA. Had it been left in the hands of the City Council, with no Section 85, this area would still be a dockland area which was no longer utilized – i.e. Under utilized lands with massive development potential. I think it is safe to say if the country was left to be run by people like you, who are also close minded, who seem to want no development what so ever - we would of never experienced the highs which we did in the past, and the highs im sure you enjoyed! Move on, get over it, and instead of blaming everybody else help come up with an idea to get us out of the mess that the whole world is experiencing! >>"we would of never experienced the highs which we did in the past,..."
Do you mean the total diversion of just about all internal-Irish investment and mindset into non-productive "investment" in rabbit-hutch flats and Anglo's ultra-vires headquarters, usw? As you know DDDA initially served the public good in the docklands; the docklands does not include Irishtown Beach at Sandymount Strand, aka the Irish Glass Bottle city-dump. Even DDDA belatedly admits its governance standards stink to high heaven, at least up to recently. 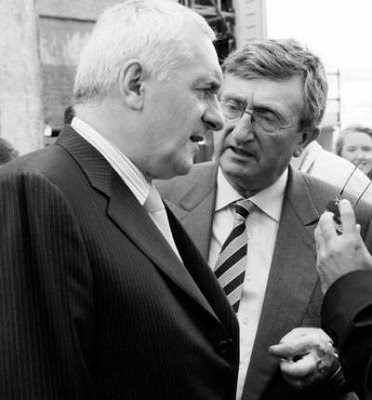 The DDDA-Anglo combo catalysed the national bankruptcy. No doubt they did that all legally. National bill: €50 Billion to €100 Billion. The whole world is not in a mess - that's a red herring from the PR dept of Anglo-Irish, FF, etc; used to fool innocent people. The inward-looking crony-capitalists, a perversion of productive capitalism, and their hangers on are the ones in a mess; unfortunately they've trapped the whole country in a mess for 10 to 20 years. Which means Ireland will be bypassed by countries with intellectual and financial strength. Nice response but you seem to have let your anger get ahead of the facts. While I will agree that most apartments that were built during the boom could be described as “rabbit-hutch flats” that majority weren’t – have a look at a little document called ‘Sustabiable Urban Housing: Design standards for New Apartments”. Anything built after the summer of 2006 were built to these stabndards which are completely acceptable living standards (DOE). If you read my first post you will see that I said that there is no doubt that Anglo is one of the main reasons we are in the position we are ion and FF are also massivly to blame. I have support FG all my life but I will hold my hands uo and say that if they had been in power during the boom (or any other political party) we would no doubt be in the same situation as we are today. ‘The whole world is not in a mess’ – Eh do you read the international papers – Greece is not a mess, Spain is not a mess, the US is not a mess???? The UK are not planning pay cuts for the public sector??? Come on wake up and stop being blinded by conspiracy theories! You still haven’t shown me a country free from corruption! As for that link haha – you have too much time on your hands!